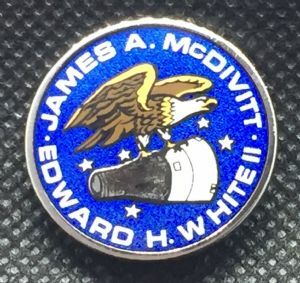 Gemini 4 Lapel Pin Ver 2. Gemini 4 was the second crewed mission of the Gemini series and carried James McDivitt and Edward White on a 4-day, 62-orbit, 98-hr flight from June 3 to June 7, 1965. 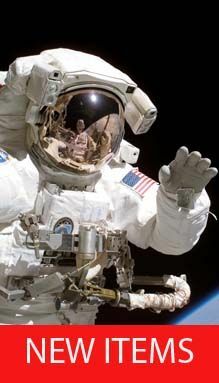 The mission included the first American spacewalk. The objective of the mission was to test the performance of the astronauts and capsule and to evaluate work procedures, schedules, and flight planning for an extended length of time in space. 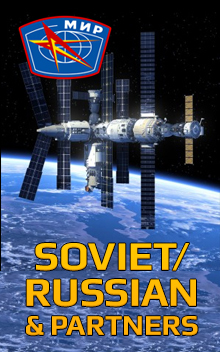 Secondary objectives included demonstration of extravehicular activity in space, conduct stationkeeping and rendezvous maneuvers, evaluate spacecraft systems, demonstrate the capability to make significant in-plane and out-of-plane maneuvers and use of the maneuvering system as a backup reentry system, and conduct 11 experiments. Gemini 4 was launched from Complex 19 at 10:15:59 a.m. EST (15:15:59.562 UT) and inserted into a 162.3 x 282.1 km Earth orbit at 10:22:05. The orbit was raised to 166 x 290 km during the first revolution to attempt a rendezvous with the second stage. This stationkeeping exercise was cancelled early in the second revolution after depletion of 42% of the fuel, it was determined that use of more fuel would jeopardize other mission objectives. White then donned special gear and pressurized his suit at 3.7 psi. McDivitt depressurized the cabin, bringing the pressure to zero at 2:33:35 p.m. EST, and the hatch was opened at 2:34. White stood up two minutes later and exited the spacecraft using a hand-held gas gun at 2:46, becoming the first American to walk in space. White was attached to the spacecraft by an 8 meter tether. The gas gun fuel supply was depleted in 3 minutes, after which White pulled on the tether and twisted his body to maneuver around the spacecraft. The extravehicular activity (EVA) lasted 23 minutes, after which White pulled himself back into the spacecraft.